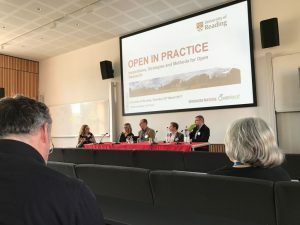 The conference featured a number of guest speakers, including academics, publishers and data specialists, who came to talk about their experience of Open Research and what it means in practice. The audience included a broad representation of University researchers and research students, members of the University’s research support services, and academics from beyond Reading. Altogether 90 people, over two-thirds of them research-active, attended the conference, and took part in a day of stimulating discussions. This is the first time the University has organised an event of this nature. Why did we do it? For two reasons. See Marcus Munafo talking about how Open Research informs research quality. A number of delegates at the conference told us about their Open Resolutions.